Successful Minneapolis fundraiser for bus to protest Trump, RNC in Cleveland | Fight Back! Minneapolis, MN - Large numbers of people came together July 1 on a beautiful Minneapolis summer evening for a ‘happy hour and appetizers’ fundraiser. The event raised money for a bus from Minneapolis to Cleveland to protest Donald Trump’s racist and anti-immigrant agenda on the first day of the Republican National Convention (RNC). 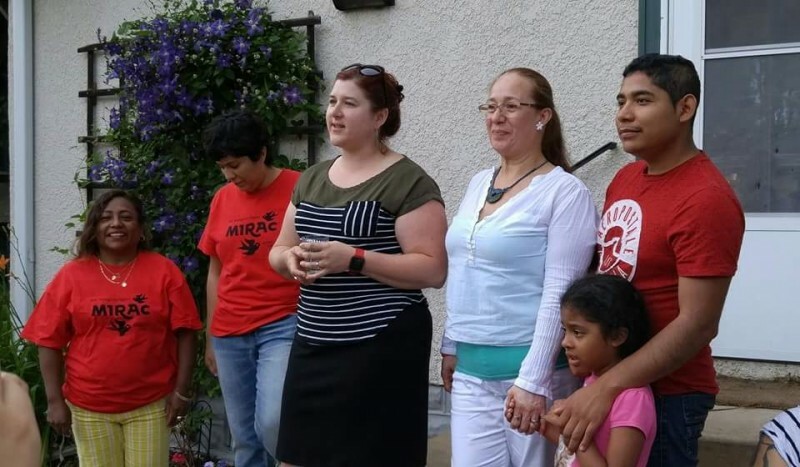 The 50-person bus is being organized by the Minnesota Immigrant Rights Action Committee (MIRAC). Several other local activist organizations are also supporting the trip and sending members on the bus, including the Anti-War Committee, Students for a Democratic Society, the Welfare Rights Committee, and others. The fundraiser was very successful, nearly reaching the amount needed to pay for the bus and trip expenses. To help reach the total amount needed, people can donate online at gofundme.com/DumpTrumpbustoRNC. Many volunteers donated their time and labor to make the event a success, including bringing a wide array of delicious food and beverages. A tablet computer was also raffled off. The event also included a short program. The main speaker was Kathleen Ganley, a University of Minnesota professor and long-time social justice advocate, who recently returned from a delegation to the U.S.-Mexico border. She gave a powerful and emotional presentation about the current reality on the border, which is already an incredibly heavily militarized zone, with tens of thousands of border patrol officers swarming, along with drones and an intimidating assortment of other military hardware. The militarized presence forces people trying to cross the border into the most unforgiving sections of the desert, leading to thousands of people dying in the desert in their attempt to get across as they flee from desperate conditions created by U.S-funded war, repression and unjust ‘free trade’ agreements in their home countries. A centerpiece of Donald Trump’s presidential campaign has been his anti-immigrant and anti-Mexican threats of mass deportations and his threat to “build a wall" to create an even more dramatic surge in border militarization beyond the already-intolerable border situation. Ganley’s first-hand report from the border drove home the urgency for supporters of immigrant rights and human rights to join the massive protest against Trump at the RNC as he is officially nominated as their presidential candidate. MIRAC is organizing this bus to protest Trump’s anti-immigrant agenda as part of the ongoing No More Deportations campaign. The campaign will continue after the RNC to demand that the new president, whoever wins the election, break from the current administration’s practice of mass deportations, and stop deportations and border militarization.